International Brotherhood of TeamstersJimmy Maerina wants Facebook to make sure its drivers are paid higher wages. Jimmy Maerina has about had it with Facebook. 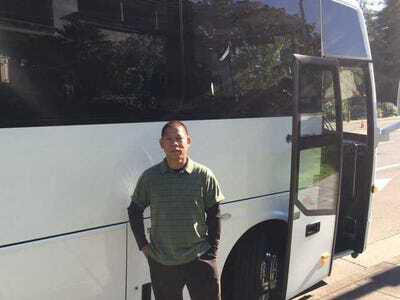 He is one of 70 bus drivers who shuttle Facebook employees from their homes in San Francisco to the company’s Menlo Park, California, headquarters 30 miles away. Though their passengers are exclusively Facebook employees, the bus drivers actually work for a company called Loop Transportation, which Facebook pays a fee to get its workers to and from Menlo Park during the week. Maerina says he and his fellow drivers work a gruelling schedule, starting their day at a bus depot 15 minutes from Facebook’s campus at 5:30 a.m. and finishing at 8:45 p.m. Although the drivers have about five unpaid hours off in the middle of the day, they are prohibited from finding other employment during that time, Maerina says. He adds that many of his coworkers live far enough from the lot that it doesn’t make sense to commute all the way home and come back. Because the rest trailer provided by Loop Transportation has only four beds, Maerina says, drivers are forced to sleep in their cars between shifts. For all this, drivers make as little as $US17 an hour. Perhaps of more concern, Maerina, who has a wife and two children, says he pays nearly $US1,200 a month for Loop’s company-sponsored health plan. On Wednesday, the drivers will vote on whether to join a local chapter of the International Brotherhood of Teamsters, a labour union that represents 1.4 million workers in the US, Canada, and Puerto Rico. If the majority of drivers vote “yes,” the union would be able to negotiate on their behalf for higher wages and better working conditions. The union vote represents what could be the climax of a yearlong war Maerina has waged against Facebook and Loop, during which Maerina says Loop has attempted to intimidate drivers from organising for better pay and Facebook has been complicit in its contractor’s actions by failing to stop them. A spokesperson for Loop Transportation declined to confirm or deny individual allegations, and Facebook did not respond to our inquiry at all. Maerina, who served as union president during a previous driving job at another company, has been trying to organise his fellow Loop drivers since February, in hopes that a union would be able to negotiate with Loop for higher wages, cheaper health benefits, and better working conditions. According to Maerina, Loop sent people to Facebook’s campus to speak with drivers about how a union would ultimately hurt their interests, a process that has continued in the months leading up to the vote. Meanwhile, he says Facebook told Loop to give the drivers a $US0.75 raise to convince drivers that they didn’t need a union to improve their work situation. “I am sure that Facebook is aware of this because if you don’t know what the heck is going on in your own home, then the home might not be yours,” Maerina says of Loop representatives sent to discourage drivers from unionizing. 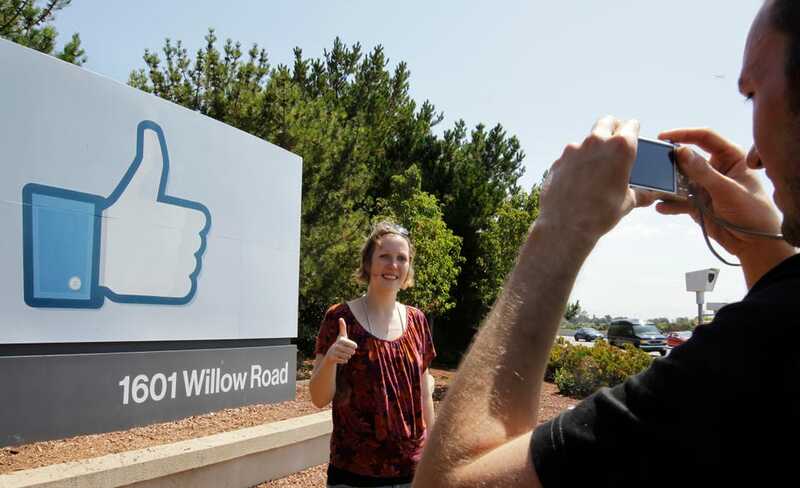 AP ImagesFacebook’s Menlo Park, California, campus has become a popular tourist destination. The spokesperson also said its drivers made between $US17 and $US25 an hour, wages the spokesperson says are among the highest in the commuter bus industry. Maerina has been joined in airing his complaints by Cliff Doi, a fellow driver who has worked for Loop for three years. In a blogpost published by the Teamsters, he says he has little downtime and actually lost vacation days earlier this year because he couldn’t get Loop to find someone to cover his shifts when he wanted to take time off. To hold a union vote, federal labour law requires a group of workers to file petition in which 30% of the employees hope to represent express interest in forming a union. Maerina says Loop attempted to fire him for speaking out but that Facebook told its contractor not to do so after USA Today contacted company officials. In addition, the driver says Loop moved its offices from Facebook’s campus to a building beside the bus lot that had previously been a room drivers could rest in. The move has led to increased scrutiny of the drivers by management, and Maerina says drivers have been further intimidated by Loop’s decision to drug test more frequently than it had in the past. Nonetheless, he says the actual act of driving passengers to and from work is relatively pleasant. He spoke highly of the Facebook employees on his route, saying that some had even written messages on an internal website encouraging the company to make sure the drivers get higher wages. In his estimation, Facebook would do well to cut out the middleman and hire its bus drivers directly, as Google did when it announced last month that it was hiring about 200 security guards who had previously been the employees of a contracting firm.